HARTLEPOOL United have confirmed on-loan Middlesbrough winger Ryan Brobbel is to stay at the club for a further month. 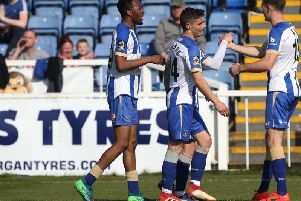 The Hartlepool-born winger has spent the past four weeks at Pools, impressing with his pace, creativity and delivery from set-pieces including in Saturday’s 2-0 win over Shrewsbury Town. Brobbel is currently on international duty with Northern Ireland’s Under-21s ahead of their UEFA European Under-21 Championship Qualifier against Serbia. That match takes place on Tuesday at Shamrock Park, in Portadown. Boss Colin Cooper confirmed to SportMail after the weekend win over Shrewsbury Town that a deal was in place to extend it for a further month. A club statement said: “Pools are delighted to confirm that Ryan Brobbel will be staying at The Vic for a further month after a deal was agreed with Middlesbrough to extend his loan period. “Brobbel has proved a big hit since joining the club on loan last month and has made seven appearances so, showing his talent on both the left and the right flank. “After starring in Pools’ 2-0 win over Shrewsbury Town, the talented Brobbel flew out to Belfast on Sunday morning to link-up with the Northern Ireland Under 21s for Tuesday’s game against Serbia.